Aniket steers Customer Success at Saviant by transforming problem statements into technological solutions. He unites his team’s strengths with client requirements and delivers quality assured projects. Aniket is the technology consultant for clients from Energy & Utility, Manufacturing and Logistics Industries. 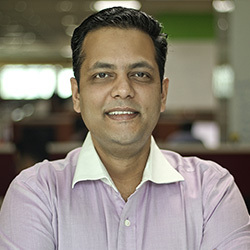 He offers solutions across data platforms, analytics, mobility & business intelligence. Aniket’s 15-year journey in the IT Industry has seen respected organizations and leadership positions. He has spearheaded the set-up of test automation practices, on-time project deliveries, sales targets and talent acquisition. He has been a mentor to teams of 100+ members consisting of Quality Consultants, Project Managers, Business Analysts, Technology Consultants and more. Aniket holds an MBA Degree from an acclaimed International University in Pune with IT as his area of expertise. A true artist at his core, Aniket practices clay modelling and carpentry.